Quick and easy and just a little bit quirky! Styled on the traditional argyle sock without the fuss, bother and confusion, Fargyles use texture and cabling to emulate the patterning of argyle. Whip a short pair up in a weekend with time for a quick round of golf on Sunday afternoon, finish a long pair by Sunday night and still catch up on some light reading. Mmmmm, fake argyle. now there is a roasty, toasty, classy sock! 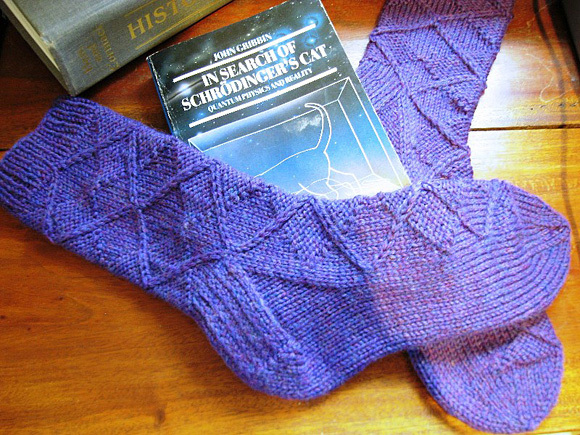 Note: Knitting these socks in DK/8-ply yarn as written will give you a sock that will fit most women and many men. 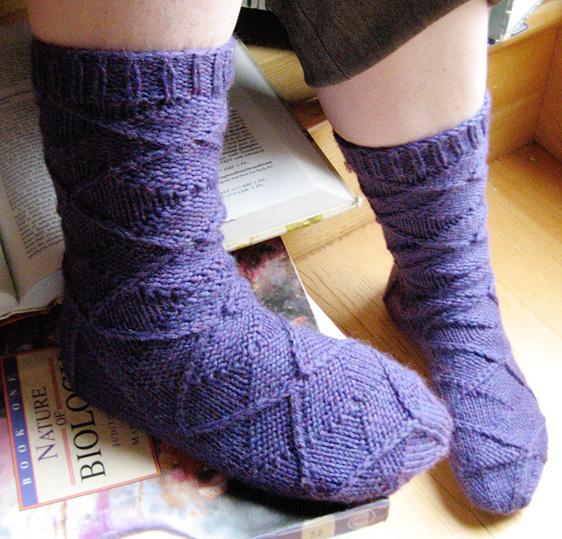 For a larger sock with no complicated math, use worsted weight yarn and appropriate needles. C1L – Place next stitch on cable needle, hold to front of work, knit next stitch and then knit stitch from cable needle. To work without a cable needle, skip first stitch and knit into back of second stitch; then knit into the front of the stitch you skipped, and slip them both off the needle at the same time. C1R – Place next stitch on cable needle, hold to back of work, knit next stitch and then knit stitch from cable needle. To work without a cable needle, skip next stitch and knit into second stitch; then knit into the stitch you skipped, and slip them both off the needle at the same time. CO 46 sts. Divide sts between needles as follows: 16 sts on Needle 1, 14 sts on Needle 2 and 16 on Needle 3. Join to begin working in the round, being careful not to twist. 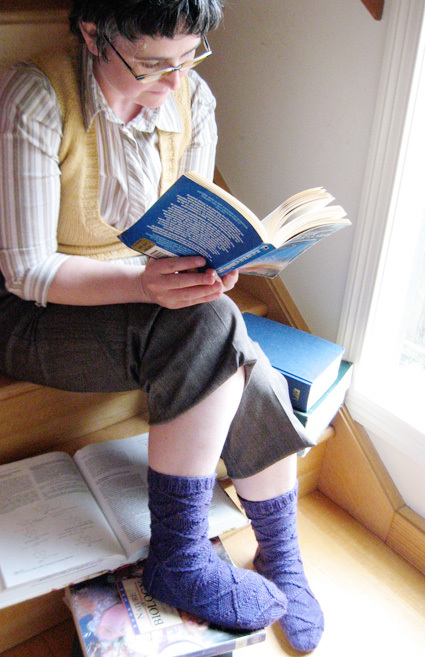 Ribbing round: [K1, p1] to end. Work 10 Ribbing rounds	in total. 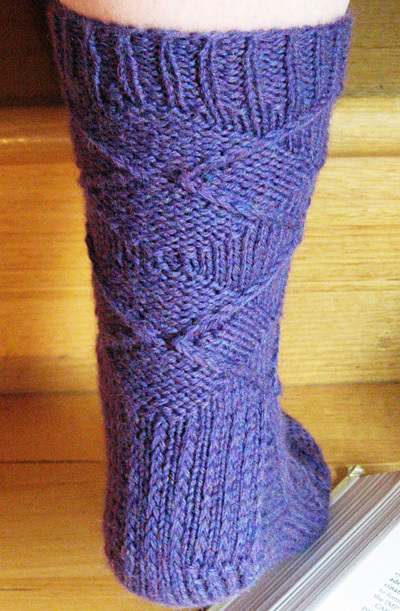 Work chart around sock – once for the front and once for the back. Place the stitch marker at the halfway point of the round – after st 23 – thus separating the front chartwork from the back. Work two full repeats for the long sock or one repeat for shorter sock. Set up row 1 [RS]: Sl 1, k2tog, [sl 1, k1] repeat to marker, turn. 22 sts. Set up row 2 [WS]: Sl 1, p to end, turn. Row 1 [RS]: [Sl 1, k1] repeat to end, turn. Row 2 [WS]: Sl 1, p to end, turn. Repeat Rows 1 and 2 a further 9 times for a total of 22 rows. Row 1 [RS]: K13, ssk, k1, turn work. Row 2 [WS]: Sl 1, p5, p2tog, p1, turn work. Row 3 [RS]: Sl 1, k6, ssk, k1, turn work. Row 4 [WS]: Sl 1, p7, p2tog, p1, turn work. Row 5 [RS]: Sl 1, k8, ssk, k1, turn work. Row 6 [WS]: Sl 1, p9, p2tog, p1, turn work. Row 7 [RS]: Sl 1, k10, ssk, k1. Row 8 [WS]: Sl 1, p11, p2tog, p1. There are now 14 sts remaining on the needle. Needle 3: Pick up and k 12 sts from the side of the heel flap (11 slipped stitches plus 1 corner stitch at the front of the sock) and then knit the first 7 sts from Needle 1. Next Round: Knit across Needle 1, continue the chart on Needle 2, and knit across Needle 3. Gusset Decrease Round: Knit to last 3 sts on Needle 1, k2tog, k1. Continue Needle 2 as per chart. Knit first stitch of Needle 3, SSK and knit to end of round. Repeat last 2 rounds until there are 11 sts on both needles 1 and 3. 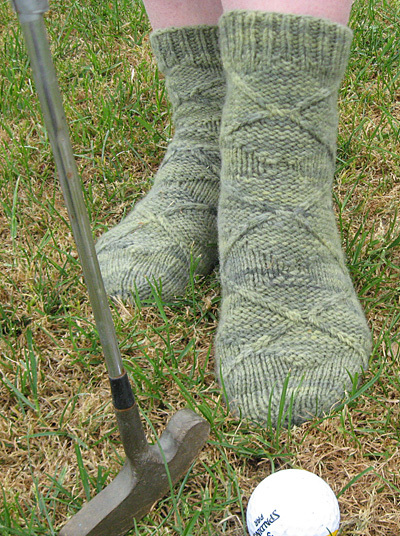 Continue to work as established – knit all sts of Needle 1, work chart across Needle 2, and knit all sts of Needle 3 – until the sock from back of heel measures 2 inches shorter than full length of foot. Round 1: K9, k2tog, k11, k2tog, k10, k2tog, k9. Round 2: [K5, k2tog] repeat to end. Rounds 3 and 4: Knit all stitches. Round 5: [K4, k2tog] to end. Rounds 6 and 7: Knit all stitches. Round 8: [K3, k2tog] to end. Round 10: [K2, k2tog] to end. Round 11: Knit all stitches . Round 12: [k1, k2tog] to end. Round 13: Knit all stitches. Knit stitches from Needle 1 onto Needle 3. Graft remaining 12 sts. Or not. Jacki Kelly is an Aussie lass who divides her time (not always evenly) between teaching high school, loving a husband, raising three kids, dancing, sewing and knitting. A dear friend rekindled a love of knitting a few years back and she has been off and running ever since. There are still those who find it very difficult to believe that she crafts. More of her work can be seen at thecompletefabrication.